I’m not much of a breakfast person. Sure, I love brunch – but I’m talking about breakfast. You know, the food that you have to force down your throat first thing in the morning? No? Anyway, I never used to eat breakfast until I realized I need to eat all three meals in order to survive the day. There are two things I eat regularly: breakfast pitas; and yogurt with granola. I’m a bit of a granola and yogurt fiend. I find store-bought granola to be expensive, and full of junk. 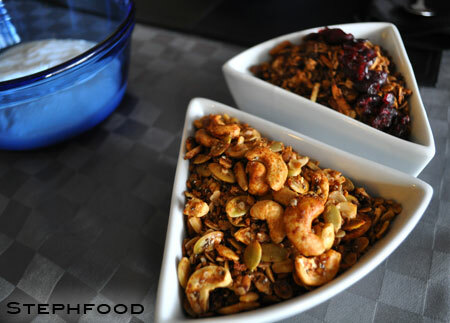 I’ve started on the path to making my own granola, full of things I like. 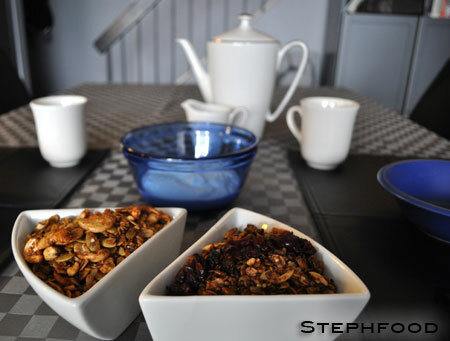 This time around, I wanted some variety so I made two different kinds of granola, instead of putting all of the ingredients into one big granola. It was a pretty good try, but I think I need some practise. The two kinds don’t taste different enough for me, so next time I’ll have to kick it up a bit. I also need to learn how to make better clumps of things – the smaller bits, like flax and chia, mostly fell to the bottom of the pan. It would be so much better if they stuck to some oats in clumps. I think adding some egg white to the mix will help with this. Next time, I’ll try not to wuss out on the spices in the Spiced Pumpkin Cashew mix, and I think I’ll add some dried apricot. And maybe add some orange juice for a different flavour? J says I’m a hippie, now that I make granola. I’m not a breakfast-making chick. When I wake up, I usually grab one of two things: a breakfast pita topped with almond or peanut butter; or a bowl of yogurt and granola. J does a little better on weekends, often making us some delicious waffles. 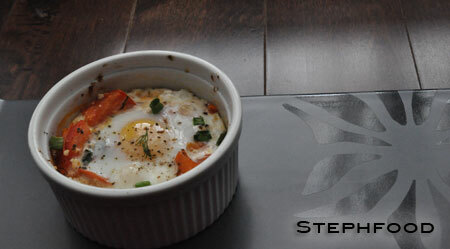 I wanted to make something special for once, so I pulled out an old copy of LCBO Food & Drink magazine, and made Baked Eggs with Feta and Dill. 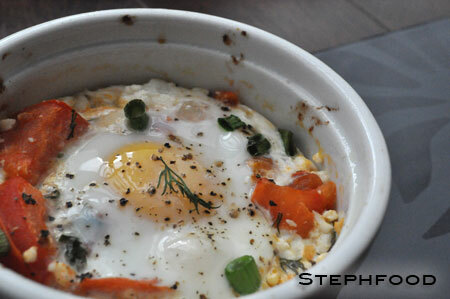 This was a simple – but fun – dish to make. I got to use my cute little white ramekins, which rarely see the light of day. It looks and tastes more sophisticated than it actually was to make. While this would be great at any time of year, I think this is one of those dishes that are best appreciated in the Spring and Summer. The light and fresh vegetable flavours are a perfect way to start the day. This would also be great as a part of a larger brunch spread, with some chilled white wine or mimosas (Darn! I knew I forgot something!). I’ve eaten Eggs Benedict three times this week. We went to three different places this week, and every time I chose a type of (non-meat) Benedict(ish). Eggs Benedict is probably my favourite “going out for” brunch food. I haven’t mastered poached eggs yet, and I haven’t tried to make hollandaise sauce. I generally don’t feel like putting that much effort into making breakfast. One small challenge – Eggs Benedict is usually hollandaise drizzled over poached egg, perched atop “Canadian” bacon laid over an english muffin. I don’t eat meat usually, and I don’t know if I’ve ever even had a “normal” Benny before. I always get the fun ones. I probably even pick the ones that I think sound the MOST fun. Sometimes that includes smoked salmon instead of the bacon, usually some kind of vegetable (spinach, asparagus, etc.). Yum!! The three “Bennies” I had were all very different, but were all really really good. I’d happily return to any of these restaurants! Sautéed mushroom on english muffin, amazing hollandaise with whole grain mustard, yummy salad. A cute little place near Church & Bloor, this was the first time we ventured inside. The brunch specials sounded great (J had some weird poached eggs in a creamy salsa dish… it was kind of like eggs poached in chili, and was really good!) and it had some yummy sounding Bennies, so we had to try it. Poached eggs on smoked salmon and home fries, topped with sautéed spinach, asparagus, hollandaise and shredded gruyere. No english muffin! Eggspectation is a chain restaurant, frequented by tourists and whatnot. That said, I’ve always had a great meal there… maybe because 75% of the time I get the California Benedict!! This dish has a good amount of veggies for me, and the sprinkles of gruyere totally sell it for me. I usually can’t finish the potatoes or the toast teepee they insist on putting on my plate. This one was a “Special Benedict”, as it wasn’t on the regular menu, but the special of the day. 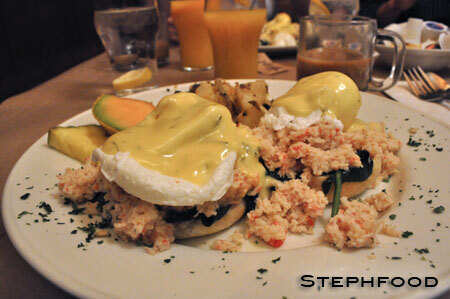 Poached eggs on english muffins, topped with snow crab meat, hollandaise, spinach. Served with a side of home fries. 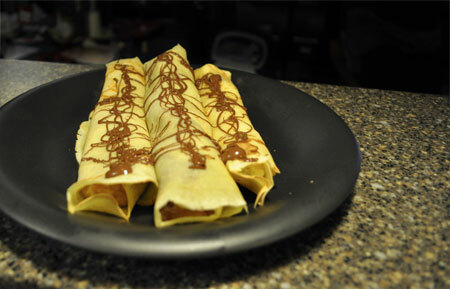 Crêpes. They’re the kind of dessert that you can pretend are a meal. At least, that’s how I do it. My valentine breakfast included some of these buttery, pliable treats filled with homemade crème pâtissière and raspberry rhubarb sauce. They were sweet, sour, creamy and delicious. 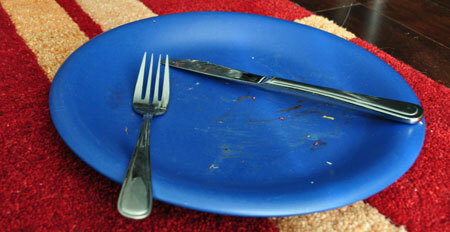 They were so good that I forgot to take a picture. I swore to take a picture of round 2, later on. Round 2 crêpes were filled with three different fillings: my usual favourite, nutella and banana; nutella and cream cheese (tastes like a cheese cake!) and the rest of the custard and rhubarb sauce from breakfast. Sooooo good!! This time, I used a crêpe recipe from the Martha Stewart site. Next time, I’m going to try one from Vegetarian Times as a comparison. The main difference between the two is the number of eggs (three) and inclusion of butter in the Martha batter. The VT version only contains one egg, which should affect both the texture and flavour. I’m also going to have to try savoury crepes, or galettes, using buckwheat flour. These could be filled with just about anything, cheeses, pesto, spinach, mushrooms, peppers. Yup, still lots of fun to be had! !